In the left panel, called ‘Nubian Star Pyramid’, the figure is adorned in a blue outfit. Blue in Ancient Egyptian thinking pertains to birth, rebirth and life cycles - reflected by the movement of the River Nile, which would annually flood the terrain to induce the fertility of the land. The Nubian reference in the triptych acknowledges the historical importance in understanding the role it played within the geographic evolution of Ancient Egypt, which depended on the flow of the River Nile. 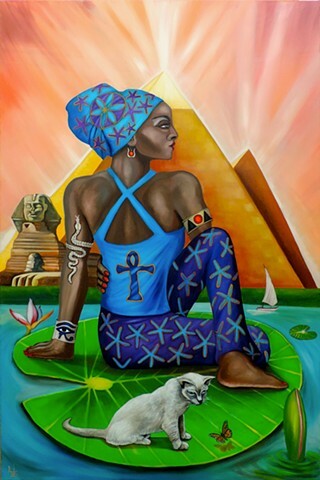 The figure wearing a Nubian head wrap brings the ancient unity of Egypt into view, reflecting the power of Nubian culture and iconography. Again the ‘seed of life’ circular pattern is present as a symbol of the life-giving water of the Nile.